Porche 959 – image © Dr. Ing. h.c. F. Porsche AG. The Porsche 959 was first shown as a concept at the 1983 Frankfurt Motor Show as the ‘Group B Studie’, a prototype for the proposed Group B motorsport regulations. To be eligible to compete in Group B racing, Porsche would have needed to make a limited number of road cars. While the Group B racing series didn’t make it to the start line, Porsche stuck with the 959, developing it into the ultimate road-going eighties Porsche. 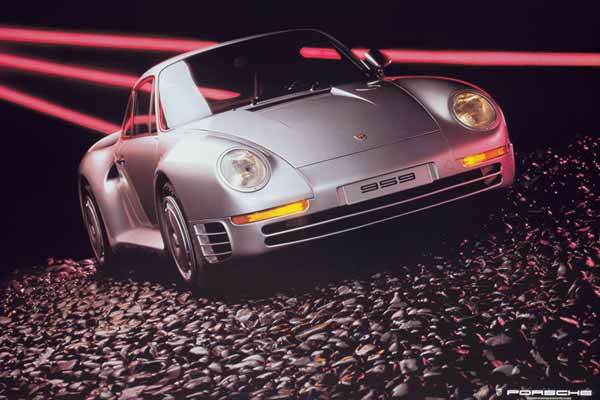 The 959 may have been based on the (then current) 911 but technologically it was a generation ahead. 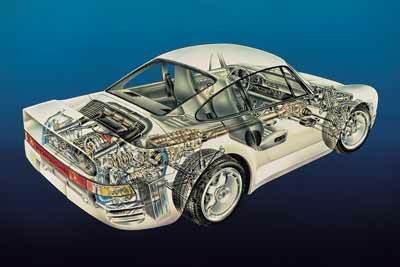 A rolling testbed packed with ideas and technology that examined how the 911 sports car could develop in future. Starting with the bodywork. The 959’s shape is still recognisably 911 but rounded and aerodynamically designed to produce zero lift. The panels themselves were made from aluminium and fibreglass-reinforced epoxy resin, clothing a sophisticated four-wheel drive system that could vary the torque between the front and rear wheels and be set into different modes depending on weather conditions. Active suspension connected with lightweight, hollow-spoked, Magnesium alloy wheels, fitted with run-flat tyres, tyre-pressure sensors and ABS. Porsche 959 – technology © Dr. Ing. h.c. F. Porsche AG. The 959 was powered by a 4-valve per cylinder, 2.85 litre, all-aluminium evolution of the flat-six engine developed for the 956 racing car that was cooled by air and water. Sequential turbochargers and intercooling (developed in-house by Porsche). Producing 450bhp at 6500rpm. This power was channelled through a six-speed gearbox and that trick four wheel drive system, enough to power the 959 from 0-60mph in just 3.6 seconds and on to a top speed of 197mph (making it the world’s fastest production car until the arrival of it’s great eighties super car rival, the Ferrari F40, in 1987). Inside the 959 was no stripped-out racing car. Luxuries like leather, electrically-adjustable seats, electric windows, air-conditioning, a radio were all there. The 959 may have been powerful but it was civilised too, a super car you really could drive every day. While this may sound cliched today, it certainly wasn’t back in 1986. The 959 was available in either “Komfort” or “Sport” trim, depending on whether you wanted to use your 959 primarily on the road or track. The track-focussed Sport models were stripped back to cut down on weight. Inside the seats were changed to sports seats and luxuries like air conditioning, central locking, the rear seats and the passenger door mirror deleted. While the height-adjustable air suspension was replaced with standard coil and strut suspension. Only 29 959 Sport were produced. Porsche offered a factory engine-upgrade that boosted power to 585bhp and torque to 425Ib ft (up from 369 Ib ft) by replacing the standard turbos with smaller, more efficient units. While the 959 didn’t turn into the Group B track weapon Porsche first intended. It did compete at Le Mans and ironically made a successful rally car. 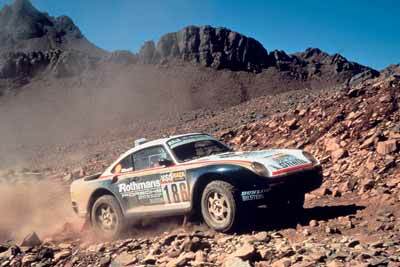 Porsche 959’s dominated the 1986 Paris-Dakar rally, finishing 1st, 2nd and 5th © Dr. Ing. h.c. F. Porsche AG. In 1986 959’s finished in 1st, 2nd and fifth in the gruelling 13,800 kilometre Paris-Dakar rally. Later that same year a 959 (racing versions numbered 961) finished seventh at Le Mans, which is impressive considering the top six places were taken by far faster Porsche Group C racing cars. At the time owners had to pay around £150,000 for their 959, less than half what each car cost Porsche to build (as the rumour goes). 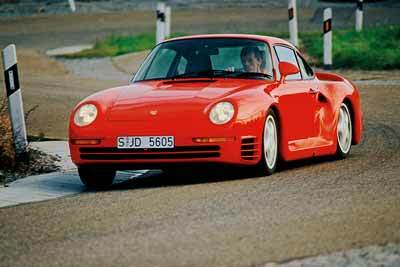 You couldn’t just walk into a Porsche dealership in 1986 and order a 959 either. Owners were selected by Porsche and had meet certain criteria. 959 buyers had to already own a Porsche, promise not to sell the car for six months and travel in person to collect their car from the factory in Stuttgart (no excuses). Famous 959 owners include Don Johnson, Martina Navratilova, Daley Thompson and Microsoft’s Bill Gates (who had to campaign for US law to be changed so he could drive his). Walter Röhrl in a Porsche 959 (1986) © Dr. Ing. h.c. F. Porsche AG. 959 production ended in 1989 after just 292 cars had been built. There was no direct replacement for the 959. Porsche made 25 examples of the 993 GT1 (1996) and then the Carerra GT (2004). 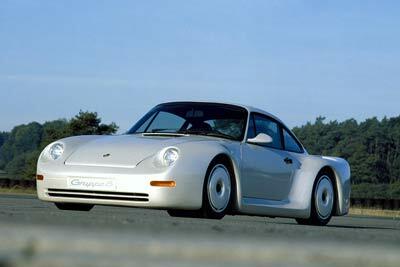 However, although both cars were built in limited-numbers, neither car represented the same technological leap as the 959. The next huge step made by a Porsche super car would be the Porsche 918 Spyder in 2013. The 959’s great legacy is arguably not the cars’ rarity and value today (over £1 million at time of writing) but that so much of the technology filtered down not only to Porsche cars’ but everyday road cars too. Porsche introduced four wheel drive to the 964 generation Porsche 911 in 1989 offered four wheel drive for the first time (with the Carrera 4, which has been a part of the range ever since). While run-flat tyres and tyre pressure monitors have become common safety features on modern cars.